Green succulents are more likely to survive indoors. Succulents are one of the most popular terrarium plants, because they are easy to find and have a variety of shapes and sizes. Succulents are frequently recognized as desert plants that prefer sandy soil, heat, and sun. Terrariums often create humid, damp, warm environments. How can you be sure that your succulent terrarium will thrive? 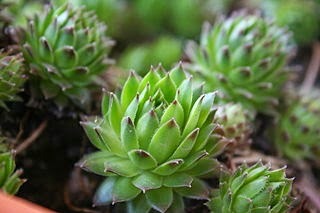 One tip is to stick to open-top or dish terrariums when planting succulents. Dish terrariums, planted in glass dishes rather than bottles, allow soil to dry out in between watering. Lee Mei Li shares eight tips additional tips for terrarium succulents in The Star Online. I share tip #3 but be sure to visit the article for the rest of the ideas! "3. Not all succulents are the same. Some may thrive indoors while others do better outdoors. Start with the greener ones as they are likely to survive better indoors."